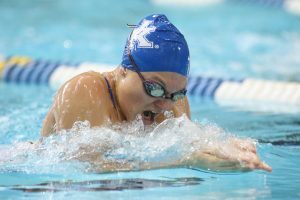 UK Swimming & Diving in action against Eastern Michigan on Saturday, October 8th, 2017 at Lancaster Aquatic Center in Lexington, Ky.
BIRMINGHAM, Ala. – Following Kentucky swimming and diving’s wins over Eastern Michigan on Saturday, senior Isaac Jones and freshman Bailey Bonnett won Southeastern Conference weekly awards, the league office announced Tuesday. Bonnett earned SEC Freshman of the Week honors, while Jones was tabbed SEC Male Swimmer of the Week. Jones was selected SEC Male Swimmer of the Week after posting a nation-leading time of 15:32.23 in the 1,650-yard freestyle on Saturday, as well as winning the 500 free. In the mile, Jones out-touched all competitors by more than 30 full seconds. The Allansford, Australia, native also helped the Wildcats to a first-place finish in the 200 free relay, swimming the second leg with a 20.93 split. Bonnett was honored as SEC Female Freshman of the Week having recorded two NCAA ‘B’ cut times in the win over EMU. The Pittsburgh native won the 100 breaststroke with a time of 1:01.43, more than a full second faster than needed for NCAA consideration. She had her second ‘B’ cut in the 400 IM with a time of 4:19.38. Bonnett swam the fastest split of any athlete in the event in the 200 free relay at 23.58, helping Kentucky’s relay team win the event. The announcement marks the first time either student-athlete have been recognized by the conference. 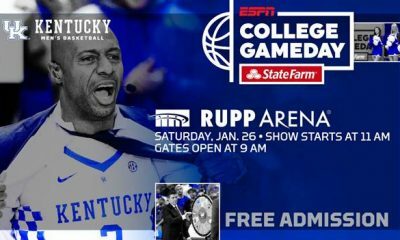 The Cats will be back in action on Oct. 27, hitting the road for the first time this season as they take on top-25 teams Tennessee and Indiana in Knoxville, Tennessee. The meet is slated for an 11 a.m. start. 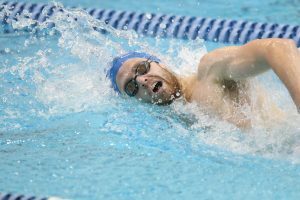 For the latest on the Kentucky swimming and diving program, follow @UKSwimDive on Twitter, on Facebook atFacebook.com/UKSwimDive, and on the web at UKathletics.com.